There are eight new calves on the farm and if this isn't a sure sign of Spring... what is? So far we've got six heifers and two bull calves. The mums are all wonderfully maternal and protective, having all 'been there done that', rarely allowing anything to come between them and their precious offspring. They have every reason to be looking pleased with themselves. The calves are a joy and they've particularly enjoyed the recent sunshine. The maternity ward is in the field on the side of the drive, so you'll see them, either bouncing about or snoozing, if you come down to the Butchery on a Friday (open between 12 and 6pm). It's hard to believe that we were sledging down this field six weeks ago! Planning ahead for Easter, there are just under four weeks 'til Good Friday. We'll be cutting the week commencing 25th March and in order to avoid disappointment (if you have a specific joint in mind) please get in touch in plenty of time. Bear in mind that we do always have some some joints/cuts available frozen. We're also pleased to renew our offer of Organic Lamb. See below for further details. Revelations in the press regarding the National and International Food Industry since our the last newsletter have been alarming and disgraceful. It makes us prouder than ever of the provenance, traceability and quality of our Beef (and Lamb). The main herd has been on some dry, gravelly land overlooking Shrewsbury all winter where they have been enjoying their silage and the views. It was time to come home on Friday. As you can see from the photographs they filled the Baschurch/Shrewsbury road and slowed the traffic for a while. Even the impatient drivers calmed down when they saw the horns! They are home for calving, although you'll notice that one of the calves has beaten us to it! She did very well to keep up with the pace and at times was leading the pack! We are renewing our offer of half a Great Berwick Organics Lamb. For £60 plus postage you'll receive a mixed box (approx 10kg) of individually packed and labelled joints and cuts. Please email us at greatberwick@googlemail.co.uk to place an order. Look what Shrewsbury has planned for the end of June! Please click on http://shrewsburyfoodfestival.co.uk for further details. Great Berwick Organics will be there! It's really good to see so many of our cool bags coming back into the Butchery every Friday to be refilled. However, we realise that it's not so easy for some of our more distant customers and in some cases you will have collected more than one. If you'd like to return these to us, we will credit you with £5 per bag against your next order. We also thought it would be fun to see where our bags are popping up. Please send any photographic evidence to us at greatberwick@googlemail.com ! While stocks last, buy one, get one free on our 500g packs of Lean Mince. The photo is to remind you of summer! Here's our trio of pies (Steak & Ale, Steak & Stilton and Steak & Kidney), sporting their new labels which have been beautifully created by Isobel Bushell, Aardvark Design and Illustration, see http://www.aardvarkid.com . This entry was posted in on 12th March 2013 by longhorn. In 2007 Great Berwick teamed up with Dukeshill Ham Company, to supply them with mixed boxes of beef, to go in their Christmas Best of British brochure. Dukeshill were very pleased to add Longhorn beef to their list of fine food as it coincided with Heston Blumenthal's Search for Perfection declaring Longhorn Beef to be the ultimate cut of beef. This entry was posted in on 19th January 2013 by longhorn. Saturday was officially the first day of winter on the Met Office calendar and it certainly feels like it. The river burst it's banks early last week and although the flood waters have subsided there are still pools of water lying in the field which have frozen over. We've got lovely bright blue skies and sunshine though today, so our memories of torrential rain and water logged fields are fading. The weather has certainly tested us this year and we very much hope that 2013 will be kinder to us. With regards to Beef we've had a great year with some very definite highlights (our Farm Tour, Ludlow Food Festival and orders from Europe (see below)). 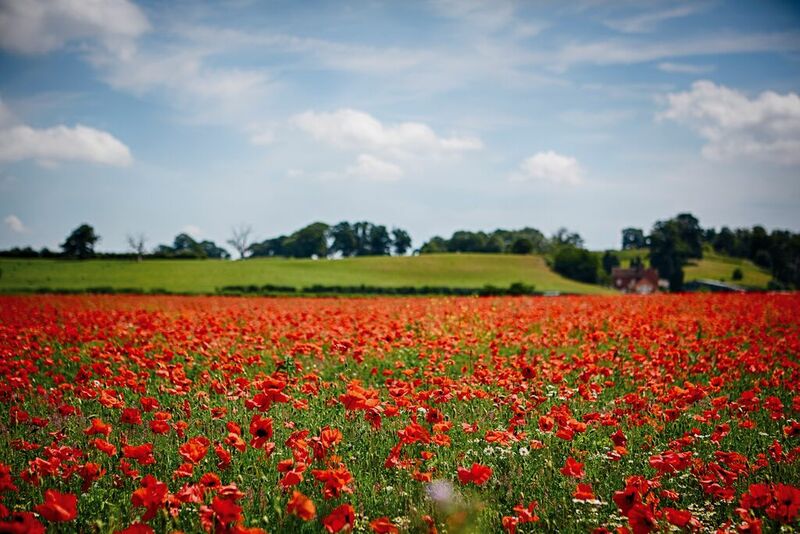 We had a look back through the year's newsletters last night (they are all stored up under the View our Newsletters button on the website http://www.longhornbeef.co.uk and it reminded us just how much fun we've had and how lovely the spring and summer can be! May we take this opportunity to thank everyone who has supported us over the year. Thank you for your kind words and your encouragement. It means alot to us. We'd like to wish you a very Merry Christmas and a Happy New Year! For £70 (plus postage) everything will be parcelled up in one of our Great Berwick Coolbags complete with some red ribbon. You can either collect or we can arrange delivery in the usual way. Go to http://www.longhornbeef.co.uk then click on our Buy our Beef for more details on this and our other Mixed Boxes. We will continue to take Christmas and New Year Orders up to and including Wednesday 19th December. For Christmas Orders we will be dispatching on Wednesday 19th and Thursday 20th December for delivery on Thursday 20th or Friday 21st December. We will, of course, liase directly with customers on which day their orders will be delivered. For New Year Orders we will be dispatching on Thursday 27th December for delivery on Friday 28th December. Please note that we have agreed a contract with a new Courier and the fixed charge per delivery will now be £9.50 ( this doesn't include the Scottish Highlands and Northern Ireland, please contact us for further details on these destinations) This figure is for any package up to a total of 20kg. We continue to offer free packaging for all orders over £40.00. Earlier this year we hosted a visit from two renowned Dutch Chefs, Richard van Oostenbrugge and Alain Caron, who were being entertained by EBLEX (a UK based organisation for the Beef & Sheep Industry). The aim was to impress them with the very finest Beef and for them to become the culinary ambassadors for British Beef in Holland. We are delighted to report that this mission has been accomplished and we have been asked to supply Cotes de beouf (Rib) and Fillet for a Formal Press launch taking place in Amsterdam just before Christmas. Sadly we won't be there personally but we are very much looking forward to developing this relationship further in the New Year. Our distribution network is also about to stretch as far as Greece, with some Sirloin winging its way over to Athens in time for Christmas lunch and we've also got some steaks going to Switzerland later this week. The winner by far though is an order from a devoted mother in New Zealand, who has arranged for us to deliver some beef to her daughter who is studying in the UK! One of our Customers recently described our pies as the 'Ultimate Fast Slow Food' the other day and we think she's summed our pies up perfectly! They are individual portions and there's a choice of: Steak & Ale, Steak & Stilton and Steak & Kidney. If Chef is tiring in the kitchen over the next few weeks, or indeed at any time, they make a convenient, and delicious meal filler. Pop them in the oven, straight from the freezer, for 35 minutes and serve with chips, boiled potatoes or rice. Oh and don't forget some peas! £3.50 each or £30 for a box of 10. This entry was posted in on 1st December 2012 by longhorn. If you're looking for the perfect gift for a Foodie or better still, a lover of beef, we'd like to draw your attention to our new Christmas Hamper. It includes a delicious selection of our 35 day dry aged beef, a matched bottle of wine and jars of horseraddish and bearnaise, all beautifully presented in a Great Berwick Organics coolbag. Please click on Mixed Boxes under Buy our Beef for further details. This entry was posted in on 28th November 2012 by longhorn. As anticipated, the River Severn burst its banks earlier today, but the cattle and sheep are all safely on higher ground. It's a fairly common occurrence for us at this time of year and thankfully no where near as bad as it is else where in the Country. Our thoughts are with those experiencing horrendous weather conditions and the consequences that go with it. This entry was posted in on 26th November 2012 by longhorn. Autumn is here! Not only have we just started lighting the wood burner in the sitting room, but we also celebrated Harvest Festival last week. It is one of our favourite church services as its such a poignant event in the farming calendar. Although the weather has taken its toll on the quality, yield and hampered its completion of our harvest, it's very satisfying when everything is finally safely gathered in. We're also really enjoying the autumn colours, seeing the rose hips and apples ripen and the flowers in the garden and along the verges set seed. The spiders too have been spinning frantically everywhere we look; the reseed in front of the house is shimmering with webs. We've included some of the photos we've taken over the last couple of weeks in the Gallery. We hope you enjoy them! Please note that our Christmas Order Book is filling fast, with Foreribs, Sirloin (on and off the bone) and Fillet proving to be as popular as ever. Please let us know as soon as possible if you'd like to place an order http://www.longhornbeef.co.uk. With a five week lead time (for dry aging) we need as much notice as possible, please. All the effort and hard work our brilliant team (Martin, Sarah and Alex) put into the preparation for Ludlow was rewarded a thousand times over whilst we were at the midst of Festival fever. Although it was our first time, Ludlow Food Festival is now in its 18th year and it is the longest running food festival in the UK. With it comes an incredible reputation and an enviable line up of Producers, Exhibitors, Chefs and all things 'Foodie'. The atmosphere over the three days was amazing and the sun never ceased to shine. We thoroughly enjoyed meeting and talking to our customers (both new and loyal) and putting faces to those of you who we have corresponded with on line. Thank you very much indeed to everyone who supported and encouraged us along the way. We are particularly grateful to the Ludlow Food Festival Committee for their Exhibitor Bursary and to the Ludlow Slow Food Group, who were our original catalysts, inspiring us to attend. Jerome Harlington from Wines Unfurled http://www.winesunfurled.co.uk was also part of the team and he complimented our beef with a fabulous Merlot. The event was great fun and it was a privilege to work alongside such an accomplished and talented Chef and and an enthusiastic young Vintner. We'd like to mention two of the Trade stands we worked with during the Festival. First, the Big Green Egg Company http://www.biggreenegg.co.uk/, who cooked our T bones and a Forerib to perfection using their revolutionary Barbeque. The audience were captivated and couldn't wait to sample to results. They weren't disappointed! The second was Dingley Dell Enterprises http://www.dingley-dell.com/ who kindly cooked pieces of our Topside to absolute perfection using their Bushman Clay Oven. The only problem was fending off the crowds (who'd followed the mouth watering smell) whilst the meat propertly 'rested' for 20 minutes! The samples were then devoured within minutes! Following its popularity at the Food Festival we'd like to extend this offer up to Christmas. It includes the following: 1kg Diced Casserole, 1kg Rolled Brisket, 1kg Shin, 1kg Mince, 1kg Braising Steak & 1kg of Silverside plus a Great Berwick Organics Cool Bag. At £50.00 it is fantastic value, representing a saving of 20% on individual pack prices. Please go to http://www.longhornbeef.co.uk to place an order. For a limited period we'd like to offer you the opportunity to purchase HALF A LAMB (approx 10kg) for £60 plus £14.50 postage and packing. To place an order please email us at greatberwick@googlemail.com . This entry was posted in on 12th October 2012 by longhorn. As I write Martin our Butcher, Jason, Sarah and Sam are flat out in the Butchery preparing to attend the Ludlow Food Festival which is taking place this coming weekend (7/8/9 September). The walk in Chiller is a sight to behold. It is a very exciting opportunity for us and we are very grateful to the Festival Committee for the generous attendance Bursary they have awarded us. The Festival has a huge following and as Shropshire producers it has been very much on our aspiration list for some time. Although Monty (our Bull) appears on the front cover of this years brochure, he won't be making a personal appearance! However,if you're planning to be at the Festival either on the Friday or the Saturday, please come and say hello, we'd love to see you! Click on the following link for more details http://www.foodfestival.co.uk . This is the title of one of the Taste Workshops taking place at the Ludlow Food Festival on Saturday 8th September. Will Holland, Chef Patron from La Becasse will be cooking seven different dishes using our beef. He's requested a wonderful selection of cuts and joints (delivered to him today) and we can't wait to see and taste what he conjours up. For more information go to http://www.slowfood.org.uk/taste-workshops-at-ludlow-food-drink-festival... We will, of course provide a full report in the next newsletter. This photograph was taken at the beginning of July and just look how high the River Severn is! It has been an exceptionally wet summer, fantastic grass growing conditions, but not so great for our cereals. The winter barley is in the shed, but the rest of our wheat, triticale and linseed is still standing in the field. We are hoping the weather holds long enough for the moisture content of the grain to reach its optimum so as to allow us to continue combining until ' all is safely gathered in'. It's an anxious time for us and for many other farmers across the country. We are pleased to report that Monty and Kennedy have been performing well and that most of the cows and maiden heifers are in calf! We're looking forward to seeing the next generation of Longhorns in the spring. This entry was posted in on 12th September 2012 by longhorn. Ludlow Food Festival, Hairy Bikers and Great Berwick Organics! This entry was posted in on 11th September 2012 by longhorn. 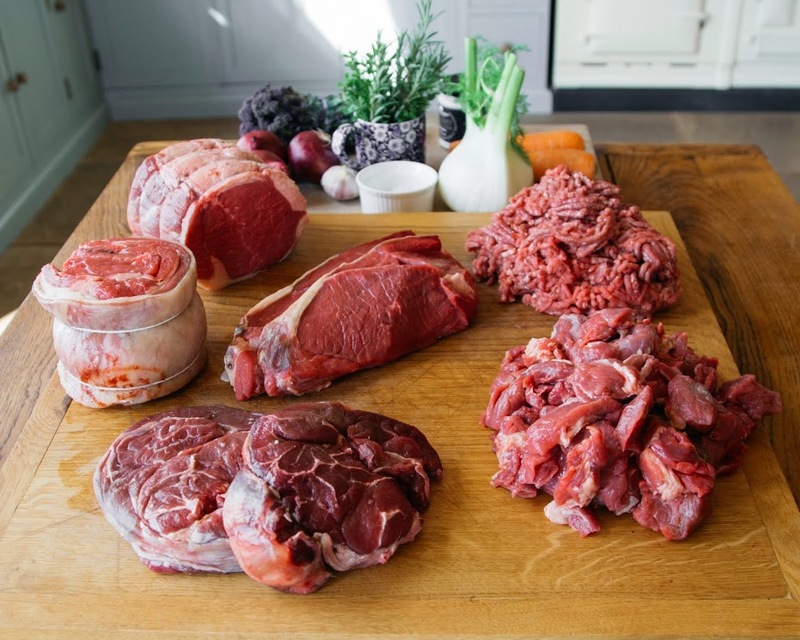 "The best beef I have ever tasted' was how Will Holland, Chef Patron from La Becasse, Ludlow described our beef during one of the Ludlow Food Festival's Taste Workshops on Saturday. The title of the workshop was 'What's the Beef?' and Will certainly took our meat, to a new level, when with his creative wizardry he produced seven outstanding tasters. We were complete Show/Festival beginners, but thanks to a bursary awarded to us by the Ludlow Food Festival Committee we were fortunate to have our Stall in full flow for two of the three days. It was a fantastic opportunity for us, providing a chance to introduce ourselves in a public arena and to draw attention, to those who haven't already met us and tried our beef, to a product we are extremely proud of. 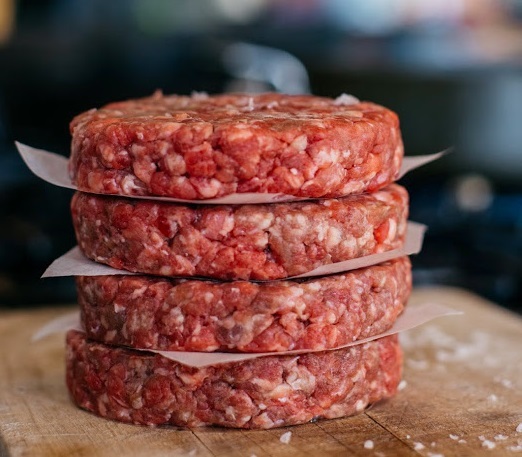 We strive to maintain the very highest standards and our aim is for people to recognise Great Berwick Organics as 'The place to buy beef' that tastes like beef used to taste and how beef should taste! This entry was posted in on 9th September 2012 by longhorn. Remember Great British Beef, remember Great Berwick Organics when celebrating this Jubilee/Olympic year! We hope you enjoy all the excuses to have fun as much as we plan to! With very best wishes and thank you for your ongoing support. ... and the cows are looking really well on it. They're also enjoying having some sunshine on their backs. They're not the only ones! The steers (castrated males) have also got a certain glow about them and are looking very handsome on our driveside field and on the ground which overlooks Shrewsbury. They've certainly got a great view. Thank you to everyone who supported us at the end of May when we we were blessed with the best possible weather for our Open Afternoon. We had nearly 40 guests, who we transported around, in style, on tractor and trailer. Everyone then an opportunity to stretch legs, jump ditches and mingle amongst the cows before returning to the house for hot beef rolls (using Silverside slowly pot roasted), beef tagine with prunes and almonds (using diced braising steak and shin) and Mum's famous lasagne (using our lean mince). We really enjoyed the day and we're keen to make it a regular event. So if you couldn't join us this time, watch this space. We cut, carted and clamped 60 acres of grass at the end of last week. This is the first of two, possibly three cuts we will take for silage, our winter forage for the herd. It is always a very exciting time with lots of activity, cups of tea and delicious cut grass smells. This is our Contractor's Forage wagon hard at work. 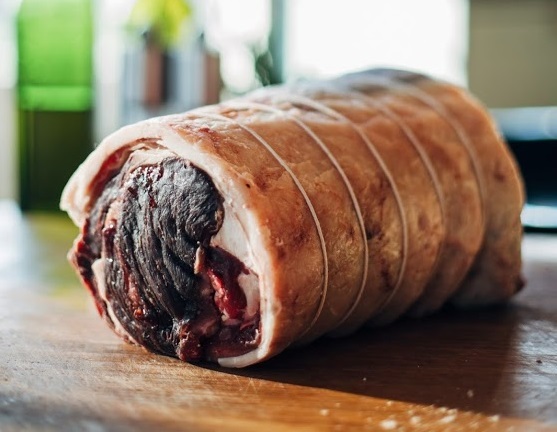 We're delighted to have been asked to supply Beef Rolls again for our local Primary School Summer Fayre at the end of the month. The plan is to serve warm slices of Silverside and Brisket in soft white rolls with horse-raddish mayonnaise. Last year they went down a treat. If you're local, please come along betwen 2 and 5pm. It's always a really great afternoon. With a premier appearance from Great Berwick Organics in conjunction with Will Holland (http://www.labecasse.co.uk/) at one of the Taste Workshops on the Saturday 8th. Tickets for the workshops are snapped up pretty quickly, so please contact Ludlow Slow Food group http://www.slowfood.org.uk/ludlow-marches/ if you'd like one. Further details from us will be announced nearer the time. Thought you might like to see this photo we took as the sun set on the longest day. This entry was posted in on 12th June 2012 by longhorn.